When my two-year-old coughed a little recently, I thought it was time to start on the cough syrup and bring out the ear thermometer. Since there was no fever as the day progressed, I was optimistic that this was a mild viral infection that would clear in a couple of days. Late that evening I was jolted out of complacence. Our son had started shivering and gasping for air; he was running a fever of 103 degrees Fahrenheit. He was also coughing in a peculiar way, best described like a dog’s bark. My husband and I rushed him to hospital, and the doctor who examined him heard the barking cough and diagnosed it as croup, inflammation of the upper airways that include the voice box and the windpipe. Our son was prescribed a dose of steroid medication to reduce the inflammation that was responsible for his breathing difficulty and the funny cough. With bronchiolitis, a viral infection of the lower bronchioles, the infection starts as a cold and fever and within 24-48 hours the child becomes breathless. “A breathless child is always an emergency situation and should be taken straight to the hospital," advises Dr Malkani. Irini Manoli, a paediatrician and research scientist with the National Human Genome Research Institute, US, surprised me with the following advice. She said that though she didn’t know which kind of croup our son had gotten, had I taken my son for a drive with the windows down, to breathe in some cold night air, that might have been enough to calm the inflammation in his throat, and neither the emergency visit nor the steroids would have been required. 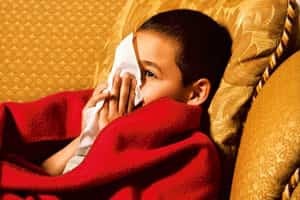 When I checked with our paediatrician in Bangalore N. Karthik Nagesh, consultant and head of department, neonatology, Manipal Hospital, Bangalore, he said that in cases of spasmodic croup, which is caused by allergies, relief from the throat inflammation is obtainable with exposure to cold air alone. In India, however, since the croup is typically not spasmodic but is caused by viral infections, when a child shows symptoms of difficulty breathing, it is best to take them to the emergency medical services of an hospital immediately. Since it is difficult for a parent to distinguish between a spasmodic croup and the viral croup, and because infectious croup can progress in severity very quickly, it is best to seek medical attention as soon as the baby is seen having breathing difficulty. In Mumbai, these respiratory diseases are generally more common in the winter and the monsoon. In Bangalore, these infections are more common from June-September because the viral load in the atmosphere increases in those months, says Dr Nagesh. In New Delhi, these infections are more common from March-April and then again from October-December, says Vidya Gupta, consultant in the department of paediatrics and neonatology, Indraprastha Apollo Hospitals, New Delhi. Parents can strengthen their children’s immunity so that even if these infections occur, they are in the mildest form. Dr Malkani says the importance of a nutritious diet consisting of home-cooked meals, fresh fruits and vegetables cannot be overstated. Though it’s ideal that the children get their vitamins and minerals largely from their diet, vitamin D often needs to be taken in supplemental form. Vitamin D is available in sachets, but the baby/child needs to take a blood test to determine if he/she is deficient in vitamin D before being given the supplement. Your child should be vaccinated at regular intervals. Dr Malkani finds that over the last 10 years, the incidence of lower respiratory infections like pneumonia has come down—she attributes this to an increase in vaccinations. Dr Gupta advises parents of newborns who are breastfed— and this advice holds true up to the age of 1—to give iron and multi-vitamin drops daily. These drops, she says, aren’t necessary for formula-fed babies since formula is fortified with iron and supplements. And these drops are usually not required after the age of 1. They can, however, be given after the age of 1 if the baby isn’t eating well. All supplements, however, should be given after consulting a paediatrician. Dr Malkani also advises reducing bottle-feeds, commonly responsible for perpetuating bacterial infections in the mouth and ear. She recommends that babies be started on solid foods as soon as they are six months to reduce the total number of bottle feeds. After six months, in any case, babies should not be given any midnight feeds from the bottle; the lingering droplets of milk in the mouth are a perfect moist environment for bacterial growth. Regular and thorough hand washing by the children and the parents, says Dr Nagesh, keeps infections down. He also suggests overcrowded areas be avoided. From June-September in a city like Bangalore, for instance, when the air is more infectious. As far as parental habits are concerned, Dr Nagesh says parents who smoke should quit, because their smoking increases their child’s susceptibility to respiratory infections. Smoke residue, when inhaled, paralyses ciliary function in the respiratory tract. Cilia are tiny moving hair-like structures in the upper respiratory tract that keep infection from finding a foothold.